This is the list of things to do in July in Japan, and the information of events, festivals and flowers in July. 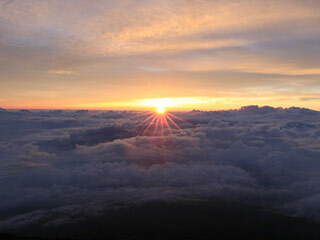 Goraiko (御来光) is the great sunrise that you can see at the top of Mt. Fuji. Mt. Fuji is the tallest mountain in Japan and the summit's altitude is over 3720m from the sea level. From this high altitude, you can see the great sunrise and sea of the cloud under your vision. You can only enjoy this sunrise during the hiking season of Mt. Fuji which is from July to the early September. To see Goraiko, you must arrive at the top of Mt. Fuji by 4:20 (depend of the sunrise time). Must likely, you would better to stay at the mountain house to stay at night and leave there in the mid-night. Takes about 5 to 7 hours from the 5th station to the top 10th station. 0. at Mt. Fuji Station. 1. use a shuttle bus to the 5th station. 2. climb up for 7 hours.